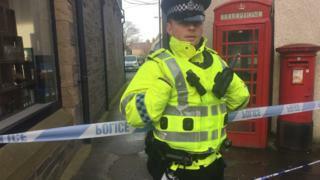 Police have sealed off a lane in the centre of Kirkwall in Orkney after a woman was sexually assaulted. The attack took place in Burn Lane, near the junction of Albert Street and Bridge Street, in the early hours of the morning. The area has been taped off by police, and an officer has been stationed to keep members of the public away. In a statement, Police Scotland said their inquiries were at "an early stage". They added that they will be maintaining a presence in the area as investigations continue. The story was originally published on 4 March 2019.